There have been wall murals adorning Tremontons streetscape since the 1970’s. As published in a Wasatch View Magazine article featuring Tremonton City’s public art written by Tim Gurrister of the Ogden Standard Examiner there was a mystery muralist from the 1970s credited with creating the first landscape murals on buildings around Tremonton. It is legend that the mystery muralist supposedly used his hair to make his paint brush bristles. Although most have been painted over and lost, you can still see one of these paintings on a building in Tremonton. From these humble and legendary public art beginnings Tremonton City has worked to amass a collection of public art. 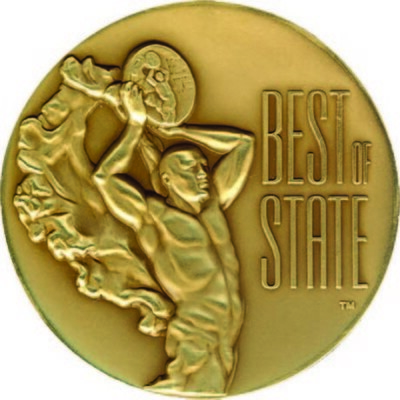 This collection went on to be nominated and to win the 2016, 2017 & 2018 Best of State award. Come visit our community, learn of our history and view what we have to offer. The booster rockets that propelled the space shuttle Columbia into space on April 12, 1981 were designed and manufactured in Box Elder County, Utah. The program began in 1972, and its final flight on July 8, 2011 was described as both inspiring and captivating. The shuttle program represents a signifanct achievment for the United States Space Program and the people of the Bear River Region who are a part of its history. Visitors can view an outdoor display of solid rocket motors at the Alliant Techsystems Inc. (ATK) launch facility, approximately 21 miles west of Tremonton. Created by Rachel Wadsworth and funded by Orbital ATK and Tremonton City. Andrew J. Russell’s “East and West Shaking Hands at Laying of Last Rail.” Commonly known as “The Champagne Photo.” The National Park Service maintains the Golden Spike National Historic Site, approximately 27 miles west of Tremonton. Created by artist Jason Nessen and funded by Union Pacific Railroad Foundation and Tremonton City. 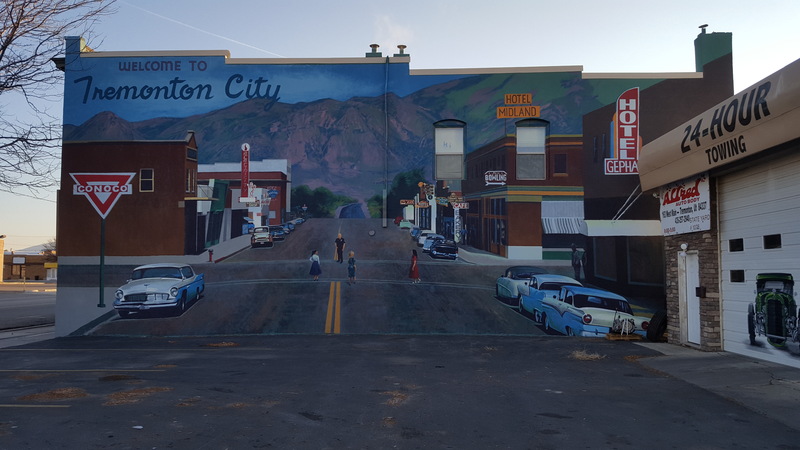 Downtown Welcome Mural depicts Tremonton’s Main street ca. 1920. The mural was created from a photograph provided to the City by Barry Cole in celebration of the Tremonton City Centennial in 2003. The mural was completed in 2014 by local artist Jason Nessen and funded in part by grants provided by Box Elder County Tourism Tax Advisory Board and by the Utah Division of Arts & Museums. place. The mural was created from a photograph by local artist, Jason Nessen in 2003, and was funded in part by the David Holmgren Family and by Jay D. & Alice C. Harris. CA.1920 – Photograph of a group of local residents and businessman as “Volunteer Firefighters.” The Tremonton Volunteer Fire Department was officially organized by the City Council on April 4, 1938, including the purchase of an American-La France fire engine for $7,078.17. Created by Jason Nessen and funded by Tremonton Fire Department Women’s Auxiliary and Tremonton City. 1st Golden Spike Rodeo Mural is inspired by a photograph taken in 1925 of the first county rodeo; also believed to be the oldest and longest running rodeo in the State of Utah. The original location of the rodeo grounds was near 300 North and 400 West in Tremonton. The mural was painted by local artist, Jason Nessen in 2007, and funding was provided by a grant from the Box Elder County Tourism Tax Advisory Board. Jeppsen Family Collage Mural was commissioned by the Darrell Jeppsen family in 2008. It depicts the life of an influential Garland/Tremonton family and long time owners of several area businesses, some of which are still in operation today. The mural was painted by local artist Jason Nessen. Home Mural was commissioned by Bear River Valley Realty, a local Real Estate firm. The mural was painted by local artist, Jason Nessen in 2007. *Note how the actual building windows are incorporated into the mural. You probably know of someone (maybe yourself) who dreamed of playing sports for a high school, college or professional team. For many, this dream starts with playing sports at a city park. This mural proudly illustrates few of tremonton’s residents who had that dream. They played, competed and had fun at North Park as well as the other parks in Tremonton. The Ladies Bear River High School Softball team were 5-peat, 3A state champions from 2008 – 2012. Mountain Mural 2 existed on an older building that once housed the City Fire Department and City Offices from the 1930’s through the early 1970’s. The building is now used for storage by a local business. See “Teton Murals” to read about how this mural may have appeared at this location. nearby Thatcher, Utah who died within six months of each other in 1944, during World War II. Jackie Allred Hunlow sculpted the portraits. Overlooking the monument is a larger-than-life bronze statue of a soldier gazing at the four brothers. The statue stands 7-feet 7-inches tall and was sculpted by local artist Val Lewis. Surrounding the memorial are stainless steel plaques where the names of over 3,000 local veterans are etched according to the wars in which they served. The memorial was dedicated on August 18, 2001. Funding to construct the mural was provided by private donations. Library Statue is where characters come to life as children read from the story of Peter Pan. The bronze statue was sculpted by local artist Val Lewis in 2007 and sits on Shuman Park property in front of the Library. Funding for the statue was provided by community donations. Shuman Park Bell honors John Shuman, one of the first settlers of Tremonton, who in 1903, donated a portion of his homestead for the creation of a community park, known today as Shuman Park. It is also a place of honor for the Town Bell that tolled curfew to children for 25 years, and rang for special occasions or emergencies until being replaced by an electric siren in 1936. The Tremonton City Library, built in 1927, sits on the southwest portion of the park property where the bell and monument were erected on July 24, 1970. The bell and monument were relocated from the front of the library to its current location in July 2014.